If you are looking to enhance the look of your natural lash line, there are a few methods you can choose to do so. The market is full of numerous eyelash extension types, from strip lashes, individual lashes, and accent lashes that you yourself can apply with an easy to remove adhesive, to longer lasting semi permanent lashes that must be applied by a qualified technician. Many people opt for eyelash extensions, even on a daily basis, because they feel gorgeous, stunning, confident, and beautiful wearing these fabulous eyelash enhancers. When your eyes truly stand out, it helps others to see deeper into who you are as a human being, for the eyes are the window to the soul after all. For these reasons, millions of women, and many men too around the world choose to wear eyelash extensions of some form. Just look at the red carpet as an example, almost every female celebrity is rocking a pair of falsies or long-lasting eyelash extensions. Throughout this article, we will discuss the various types of lash extensions, in addition to what sets them apart from one another, and what the pros and cons of choosing each entail. Most of all, we will cover how long each type of eyelash extension can last, the price of each option, and where you can purchase them yourself if you have decided upon a specific type of lash extension to wear. What Are Eyelash Extensions and How Do Eyelash Extensions Work? Eyelash extensions work by amplifying and enhancing your natural lashes and lash line. There are various types of eyelash extensions, which we will explain later on in this article, but most individuals opt for the single application strip false eyelashes, or for professionally applied semi permanent extensions. Strip lashes are the type of falsies that we normally review on Alleyelashes; the kind you have to glue on yourself and remove at the end of the day when you are taking off your makeup. Semi permanent lashes, on the other hand, should only be adhered by a qualified technician, and they last usually a few weeks, depending upon the individual. Very often, those curious about this eye-enhancing beauty treatment wonder, “are eyelash extensions safe?” The answer is yes, absolutely. Semi permanent eyelash extensions, when applied by a qualified professional, are completely safe and actually quite comfortable to wear once you have become accustomed to the initial application. Best of all, you won’t need to ever apply strip falsies again, or even mascara. Depending upon the type of eyelash extension, the application process is normally 100% painless, the only exception to this is the permanent eyelash extension option, which is done under a local anesthetic, so you should not be able to feel any discomfort either, possibly just some soreness after the procedure. Depending on what you’re looking for, there are a number of false lashes and lash extension options on the market. In this section, we’ll discuss what your possible choices are. False eyelashes in a strip, accent, and individual form can be applied at home and by yourself. These falsies can be often bought from your local drugstore, and are worn throughout the day until you’re ready to remove your makeup – and your false eyelashes with it. There are a few varieties on the market in regards to form, but then the selections become further diversified when the material is taken into account. Common materials used for day wear false eyelashes includes, silk, synthetic fibers, human hair, and mink hair. In this section, we will discuss strip lashes, accent lashes, individual lashes, and magnetic lashes. The longest of all the choices, these lashes are the full length of your eyelid, which maximizes the effect of wearing falsies. Strip lashes often need to be trimmed down to fit your eye, and it is also important to consider your eye shape and eye size when determining which eyelash style would be most suitable for you. Accent lashes are like strip lashes, except they are either ¾ length or they are made to just amplify the corners of your eyes. These lashes are normally a little less expensive than full strip lashes, but they also produce a more natural, subtle appearance. Individual lashes are individual hairs, or clusters of a few hairs, that are similar to semi permanent extensions, except they only last the day and then must be removed later on. This option produces a bit more of a natural effect, which is why many individuals, including makeup artists, opt for these flawless looking falsies. Magnetic eyelash extensions do not have to be applied with adhesive, instead, small magnets implanted into the lashes are used to hold your falsies in place. Some lash wearers prefer this choice, because some are sensitive to the ingredients in lash glue, or simply want to be able to wear falsies on the go. You can read about how to apply magnetic eyelashes in our how-to guide. Semi permanent eyelash extensions are a popular pick because they aren’t as permanent as lash implants, but also only need to be applied by a professional every 2-3 weeks. This option, however, can be costly, which is why some like to stick with other selections. Semi permanent eyelashes can be made from various materials. Mink eyelash extensions are probably the most common, but silk and synthetic fibers are also sometimes utilized. Often, as the client, you have a preference, but some technicians are the most comfortable working with their materials and will pick for you. It is possible to choose your style of semi permanent eyelash extensions. Natural eyelash extensions and classic eyelash extensions are normally the most common, but others will opt for dramatic eyelash extensions. Permanent eyelash extensions are also called lash implants. This is a surgical procedure performed by a qualified doctor and normally takes about 3-4 hours in total. The worked on areas are numbed with a local anesthetic, which makes the procedure itself relatively pain-free, but some patients do experience soreness once the anesthesia wears off. This procedure is only done once for a lifetime of long lashes, but you will have to regularly keep up and maintain the length and curl of your newly implanted hairs. If you’re asking yourself “are eyelash extensions worth it?”, it may be best to weigh out the pros and cons of getting eyelash extensions. Strip lashes and their varieties must be reapplied every day you want to wear them again. This can be done from the comfort of your own home, so at least you won’t need a professional’s help for this. With this being said, these lashes essential last no more than 24 hours per wear. The lashes themselves can be worn many times. Depending on the lash, you will be able to rewear your falsies between 5-25 times usually. Semi permanent eyelash extensions typically last 2-3 weeks depending upon the individual and how fast your natural lashes grow. That means you will have to go back to the salon after that duration of time and go for a touch-up, which is thankfully a bit cheaper than the initial set. That is why it is important to set up an appointment for a touch up in a timely manner so that you are not charged extra for being a bit too late. Permanent eyelash extensions, also known as lash implants, will last a lifetime after the procedure. You will never have to worry about your lashes again, but after the surgery, you will need to perform regular maintenance on your lashes. The implanted hairs will grow at the same speed as the hairs on your head, so you will need to trim them and curl them often. 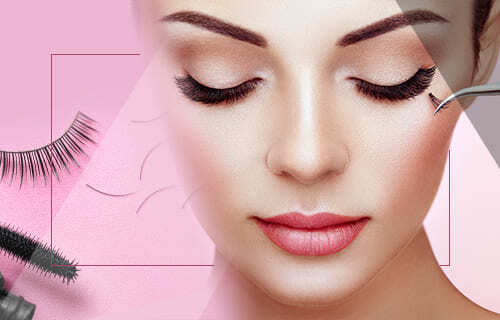 Eyelash extensions cost various amounts, depending upon the style of extension. We mentioned the varieties earlier in this article, and the most expensive option by far is permanent lash extensions, also called lash implants, but they are also a one time only cost. On average, permanent lash extension procedures cost around $1,750-$3,000 USD per eye, which is quite a hefty sum for many. Next in line is semi permanent eyelash extensions, which can range anywhere from $100-$500 USD depending upon the set and material used. Semi permanent lash extensions are typically available in 3 materials; synthetic, mink, and silk. It is often that technicians use mink due to the weightlessness of this material. One-day-wear falsies, whether in strip form, accent lash form, or as individual lashes, are by far the most affordable, and it is possible to get a quality pair of these extensions for $5-$30 USD. This eyelash extensions price is low because these lashes are only wearable for a 24 hour period at most, but they can be reused usually between 10-25 times. If you are looking to buy falsies that you can glue yourself, the best place to start your search would be your local drugstore or pharmacy. Often times brands like Kiss, Ardell, and Eylure are sold at drugstores, always for an affordable price. Beauty stores also sell false eyelashes, including companies like Sephora, MAC, and Ulta. If you don’t feel like shopping in person, online is your next go-to resource for strip and accent lashes. Brands such as Tatti Lashes, Baddi B, KoKo Lashes, Lena Lashes, Artemes, and J. Cat Beauty sell either only online or predominantly online, so their websites are extremely user-friendly and easy to navigate because they are accustomed to online orders. Semi permanent eyelash extensions can only be acquired at a professional salon, for they must be applied by a qualified technician. A simple google search saying “eyelash extensions salons near me” or “eyelash extensions near me” will find salons in your area that apply eyelash extensions, but make sure to thoroughly read reviews before settling on a salon and booking an appointment. Permanent eyelash extensions, also known as lash implants, can only be performed by a qualified doctor, and this procedure can be dangerous if done by the wrong individual or by someone who is not a professional. Therefore, it is vital to research your eyelash implant doctor, have a consultation with them, be in complete communication with them, and book your appointment well in advance. If you desire a fresh new set of lash extensions to spruce up your makeup look, then the next step would be picking the right type to fit your needs. Each type of eyelash extension lasts for a different duration of time, and all of the options available on the market are vastly different from one another. We hope this article was able to bring some clarity regarding the different types of lash extensions, along with how long they each last. Take time to think about your decision with eyelash extensions, and carefully weigh all the pros and cons before making a bigger decision, such as getting semi permanent or permanent lash extensions (lash implants).